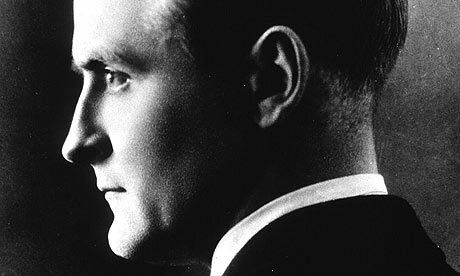 This week has been a momentous one in regards to PennSound's Classics Page: on Monday, we unveiled our new William Blake author page, and today, we proudly present a new author page for F. Scott Fitzgerald. This page doesn't house recordings of Fitzgerald reading his own lyric prose, however, but rather a brief Los Angeles recording session that took place at some time in 1940 — the last year of the novelist's life — in which he recited a trio of favorite works. He begins with John Keats' "Ode to a Nightengale," continues with John Masefield's "On Growing Old," and concludes with a soliloquy from Shakespeare's Othello: the title character's speech to the Venitian Senators. Running just over five minutes, this session is painfully brief and yet a wonderful, rare opportunity for listeners to connect with the voice of one of America's greatest literary figures. Moreover, his choice of readings (including the fact that he opts not to read from his own work) have an added poignance when we consider the one-time Romantic Egoist, now a failed Hollywood writer several years removed from his last published collection, scarred by romantic tribulations and aesthetic disappointments. We couldn't be more proud to be able to present these recordings, and are grateful to the Irvin Department of Rare Books and Special Collections, Ernest F. Hollings Special Collections Library at the University of South Carolina for granting us permission to share them with our listeners. Threads Talk Series: Cecilia Vicuna, "Knotations on a Quipu"
We recently posted recordings from the latest event in the Threads Talk Series, featuring the marvelous Cecilia Vicuña. Entitled "Knotations on a Quipu," Vicuña's talk, recorded on November 3, 2010, is centered around the quipu, an ancient Incan recording device made from knotted threads and animal hair. Vicuña begins with the story of the book's arrival in Peru, via Pizarro, however "simultaneously and long, long before even a script, the concept of writing was born, people were working with threads, speaking to threads and with threads, and recently it has been found in Peru, a 5000 year old quipu," which "changes world history completely": "if a quipu was already fully formed 5,000 years ago" — predating Mesopotamian cultures of writing — "you can only guess how long it had been information." Moreover, "when we think of the quipu as an Inca thing, we're only thinking of the crest of the tip of the iceberg," she explains, "because the Incas are a very later development, they only showed up 100 years approximately, or perhaps 2-300 years at the most, before the Spaniards arrived. So long before there is this imagination entering the threads." Thus, at Steve Clay's invitation to take part in the Threads series, Vicuña sought to create her own quipu — "a quipu infested with the idea of the book, a quipu contaminated and transformed by the book" — and the end result, in part, is her talk. Co-curated by Steve Clay and Kyle Schlesinger, the Threads Talk Series "is devoted to the art of the book featuring poets, scholars, artists, and publishers," and seeks "to build on the discourse within book arts to explore and enrich relationships between various strands of book culture that are often approached in isolation," such as "poetry and writing, visual and performing arts, collaboration, design, printing, independent publishing, literary history, critical theory, and material culture to name a few." You can listen to five previous events featuring Alan Loney, Charles Alexander, Simon Cutts, Buzz Spector and Jerome Rothenberg on PennSound's Threads Talk Series homepage. This evening at 6:00 PM (EST) you can tune in to a live stream of a very exciting symposium taking place at the Kelly Writers House tonight. Al Filreis has curated a remarkable gathering of poets to present brief commentaries of books of poetry published in 1960 — to help mark the 50th anniversary of each. Each poet will read his or her 500- to 750-word critical commentary or retrospective review, after which there will be a Q&A session and a celebratory reception. 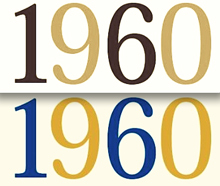 The poet's commentaries will later be published as a special feature on the poetry & poetics of 1960 in Jacket2. 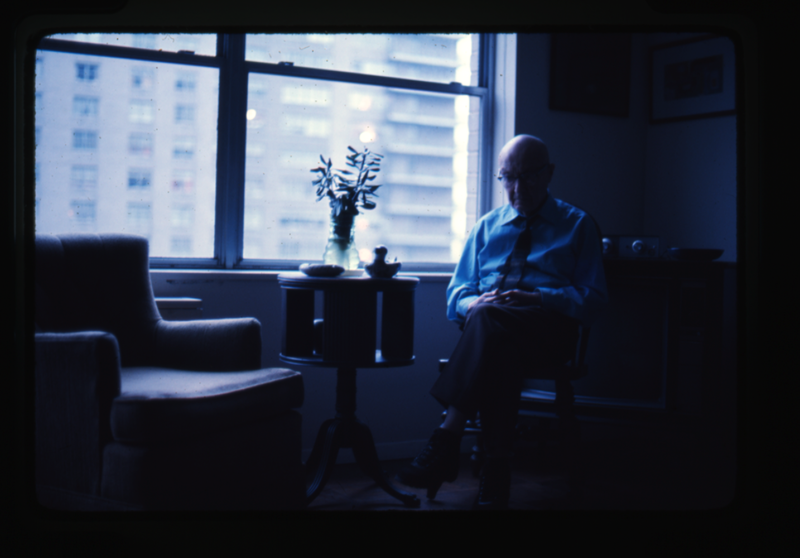 One of the rare recordings that got PennSound's year off to a great start was filmmaker Abraham Ravett's home recordings of Charles Reznikoff reading from his final book, Holocaust, which we released in late January. Today, we're proud to present an essay by PennSound co-director, Charles Bernstein, entitled "Reznikoff's Voices," that accompanies a new CD release of these recordings. Framing Holocaust through texts such as Whitman's "Song of Myself," Rukeyser's "Book of the Dead," and Reznikoff's own Testimony, Bernstein observes, "By its nature, if it doesn?t demean nature to use that word here, the material of Holocaust overwhelmed the techniques Reznikoff had developed in his earlier work. A certain level of distance from this material — its "objectification" — is not possible in reading this work, even had the technique been identical. The distinction is at the heart of what makes Holocaust so compelling: it forces a confrontation with the way the "same" conceptual approach works with differently charged material. Testimony developed a form suitable to its content; on the face of it, this would not be possible for Holocaust. He continues, addressing Ravett's recordings specifically: "Something happens, however, when we listen to [these] audio recordings, that changes everything: Reznikoff's voice. In Reznikoff's earlier recordings (available on PennSound), his voice is warm, friendly, compassionate, world-embracing, and empathetic. Not here. Reznikoff does the Holocaust with fiery and defiant voices. While his earlier readings bring out qualities of witness and engagement fully present in the text, Reznikoff?s readings from Holocaust bring in a tone not present in the written poems." You can find a link to the complete essay on the special page we've put together to house Ravett's recordings of Reznikoff reading from Holocaust (where you'll also find rare and candid photos taken that day, including the one you see above), as well as on on Ravett's website (where you can find more information about the new CD), and don't forget to visit our main Reznikoff author page, which houses two complete readings, a series of interviews at SUNY-Buffalo, a 1975 appearance on Susan Howe's WBAI poetry program and a number of other wonderful recordings. In 1992 made the unlikely move from Santa Cruz to Albany to pursue a Ph.D., partially because Katie Yates told me about a fascinating collaborative writing initiative Don Byrd spearheaded there. Too much technical & social back story to tell, but a performance group consisting of Sandy Baldwin, Belle Gironda, Eric Douglas, & I emerged named Purkinge (after brain fibers that conduct an electrical stimulus enabling the heart to contract in a coordinated fashion). Networked writing conducted across a series of computer terminals, sound, & stage were emphasized. We made hundreds of pages of poems, hours of multi-track recordings, played arts venues & theory conferences. Intent on re-defining expressive conventions, we weren't together to be popular or make money; we liked each other & did whatever we wanted given what we had ("being only possible because of gravity"). I was the only musician in the group, but our shows always featured soundtracks with everyone's input. 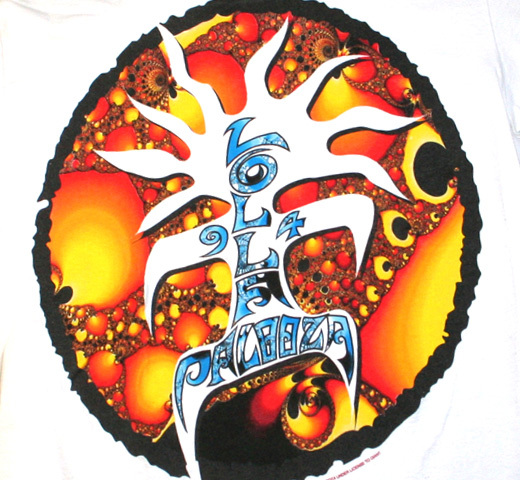 We peaked in so many ways at the Saratoga Raceway stop of the 1994 Lollapalooza festival. People I knew were running a side stage, & various friends traveled show-to-show. I was invited to join & round up local talent. Purkinge worked on a set for a few weeks, mixing a 23 minute soundtrack combining ambient recordings, percussive segments, & language. We made several hundred 10 inch segments of dowels for the crowd. Voices on tape freed us from being bound to microphones, so we moved around a lot. We planned an interactive experience with the audience, & an almost unbelievable thing happened. Gorgeous afternoon: main-stage sets by the Breeders & Boredoms transpired under sunny skies. I wore a skirt, & a random party girl said, "I'm glad you're man enough to wear that." Shortly before Purkinge's show beneath a mini-circus tent on the infield, black clouds roll in & — simultaneous to thunder playing on our soundtrack — an intense thunderstorm hits. Suddenly five- or six-hundred people were in the tent, many of them hopped up, drumsticks in hand, performing. Boisterous & strident, beautiful within the larger event, we lashed folding metal chairs to ourselves, played & crashed into each other, setting a certain tone. As we finished, the rain stopped, then we danced with everyone else to George Clinton (P-Funk All Stars) & Beastie Boys in the mud. Chris has done a wonderful production job here, creating a spacious mix that benefits those listening on headphones in particular, and leaving plenty of room for conversant dynamics to develop between noise, music and the sparring voices. You can hear this track, along with a wide array of readings, performances, interviews and lectures on PennSound's Chris Funkhouser author page. We're very happy to start off this week by announcing that audio and video coverage of last Monday's Poetry in 1960 Symposium, organized by PennSound co-director Al Filreis, is now available for streaming and download. I was honored to be a part of this electrifying event, discussing Daisy Aldan's editorial work on the anthology A New Folder, as part of a staggeringly talented panel of poets and scholars — Danny Snelson (who spoke on John Cage's Cartridge Music), Erica Kaufman (on Barbara Guest's The Location of Things), Bob Perelman (on the Donald Allen-edited The New American Poetry), Mel Nichols (on Bill Berkson and Frank O'Hara's Hymns of St. Bridget), Ron Silliman (on Robert Duncan's The Opening of the Field), Judith Goldman (on Gwendolyn Brooks' The Bean Eaters), Chris Funkhouser (on Jackson Mac Low's Stanzas for Iris Lezak), Kristen Gallagher (on LeRoi Jones' Preface to a Twenty Volume Suicide Note), Rachel Blau DuPlessis (on Frank O'Hara's Second Avenue) and finally, Charles Bernstein (on Larry Eigner's On My Eyes) — most of whom are visible in Funkhouser's photo from the podium, shown above. While this roster of panelists and subjects is, no doubt, impressive, it only tell's half the story: first, there's Filreis' wonderful critical introduction, which frames the year's poetic innovations through some misguided (and in retrospect somewhat hilarious) contemporary comments by Stanley Kunitz on both the stale state of experimentalism in that era and the future shape of American poetics. Filreis also coordinates a lengthy and spirited discussion period (running nearly an hour) that follows the presentations, and features commentary from the panelists themselves as well as many of the audience members (including CAConrad, Frank Sherlock, Jeffrey Boruszak and Jacob Russell). Don't forget that all of the presentations, as well as a transcription of the concluding discussion and a number of additional solicited reflections will published as a full-length feature, edited by Filreis, in Jacket2 early next year. PoemTalk 38: Norman Fischer's "I'd Like to See It"
Last week saw the release of the thirty-eigth episode in the PoemTalk podcast series, focusing on Norman Fischer's poem "I'd Like to See It," from his 1989 collection, Turn Left in Order to Turn Right (O Books). For this program, host Al Filreis, was joined by a trio of frequent PoemTalk panelists: Frank Sherlock, Julia Bloch and Linh Dinh. Filreis starts by asking the panel to discuss Fischer's evolving use of the titular refrain — for Sherlock, it's tied to Fischer's notions of words as both objects but also ephemeral, so that the "that way" of "I'd like to see it that way" has a different meaning each time, and both he and Bloch cite specific examples, as does Dinh, who sees the repetitions as jokes that eventually become "annoying." The conversation then shifts to considerations of Fischer's Zen Buddhist practice and the ways in which it shapes his aesthetic. Sherlock sees a meditative quality in the refrain's repetition and observes that "Fischer has talked about unintentionally having his religious practice coming through his work, his poetics, while at the same time viewing them as two very different practices." "Over time," he continues, the poet has come to this realization and acknowledged that "on some level, he needed to embrace that." Filreis points out a difference between "the way the world is and the way the world is he were able to see it the way he'd like to," which "suggests a discomfort with the world, rather than living in the present." Dinh focuses in particular on Fischer's thwarted desire to see an end to war (which seemingly can never end), leading Sherlock to address this contradiction, invoking the poet's adage, "To be without content, but full of light," where the poem's "it" (which Fischer variously would like to see one way or another) represents "that light, that consciousness . . . a toward, an unfulfilled." Bloch recalls Fischer's ideas regarding presence and the shape of poetry — "each line puts the present moment into a form and then immediately moves on to the next form, all these forms are ephemeral" — and in this way, Filreis finds a meditative practice because the refrain forces him to "stop and reorient," serving as "a breathing in, a taking stock," which Dinh relates to the commercial breaks in our current television-driven culture. Next, Sherlock points out the difference between traditional Zen Buddhist poetry and its American manifestations, finding, for the latter, post-war affinities with the avant-garde and jazz. Focusing specifically on Fischer's own writing practice, he finds Zen influence in "the idea of being grounded in silence, and that the use of language is profound when that silence is broken." Playing off of this idea, Filreis reminds the panel of the importance of improvisation to Fischer, making Zen practice "a way of reminding himself always" that his endeavors are "ephemeral ... present ... passing." The panelists then consider the poem's focus on the present and the future, before considering whether the refrain has ironic implications — Filreis offers that he might be aspiring to attitudes he already has, in light, peaceful spirit. Offering their final thoughts, Filreis observes that Fischer's poetic attitude is "the opposite of proselytizing" — "he really doesn't want to come on like somebody who has the way and you should find the way" — and in this, he finds great beauty. Sherlock remarks upon Fischer's great friendship with Philip Whalen, finding, in the refrain to "I'd Like to See It," a connection to Whalen's image of the recurring "continuous nerve movie" that's different every time. Bloch focuses on the problem present in the poem's final lines, finding different and useful interpretive possibilities. Finally, Dinh questions the poem's tone, wondering whether "you can infuse poetry with more hysterical emotions [while] retaining the light and not get[ting] stupid and silly and turning people off," though he also finds something civilized in the poem. 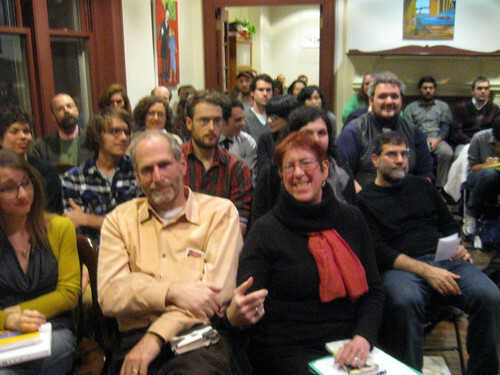 PoemTalk is a co-production of PennSound, the Kelly Writers House and the Poetry Foundation. If you're interested in more information on the series or want to hear the previous thirty-seven episodes, please visit the PoemTalk blog, and don't forget that you can subscribe to the series through the iTunes music store. For our next program, Filreis will be joined by Tracie Morris, Herman Beavers and Josephine Park for a discussion of a poem by Ethridge Knight, and stay tuned for future programs in the series that will address poems by Joan Retallack, Susan Schultz, Ezra Pound, Nathaniel Tarn and John Wieners. Thanks, as always, for listening! 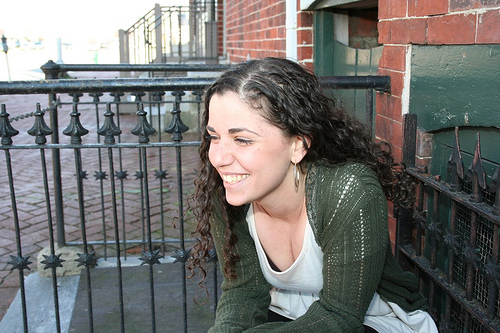 Since joining the Kelly Writers House staff as assistant to the director in 2008, Michelle Taransky has been an integral part of Philadelphia's (and UPenn's) writing community, most notably as the co-curator (with Emily Pettit) of the Whenever We Feel Like It Reading Series. While a great many recordings of Michelle could already be found scattered around PennSound and the Writers House websites, there were very few of her reading her own poetry — an unfortunate situation I sought to remedy while I was in town for the Poetry in 1960 Symposium, inviting Michelle to stop by our studios at 3808 Walnut the following day to record a session. Thanks to the indispensable Jeff Boruszak (who produced and edited the recordings), we're very proud to unveil a new PennSound author page for Michelle. This new session features twenty-two poems in total, drawing exclusively from Taransky's 2009 collection, Barn Burned, Then (selected by Marjorie Welish as the winner of Omnidawn's 2008 Poetry Prize), with selections taken more or less equally from the book's two sequences, "Burn Book" and "Bank Book." Some of the titles include "Barn Burner, Say It," "A Stutter, Following," "Fall Instructions," "The Way The Bank Works," "Saving For A Purpose" and "Theory For Building Where Fault," and in this aural setting, the hypnotizing recursivity of Barn Burned, Then's tightly interlinked poems, as well as Taransky's clever, elusive wordplay are on fully display. While browsing through the new page, you'll also find audio and/or video from a wide array of events like The Mind of Winter, the annual Six Poets Teach event with Friends Central Students, "William Carlos Williams and the Women" and the 2008 David Foster Wallace memorial reading. To start listening, click on the title above. This week, we'll be catching up with highlights from the Segue Series' fall season at the Bowery Poetry Club, starting today, with October's readings. Segue's thirty-fourth season started on October 2nd, with the pairing of Marie Buck and Kim Rosenfield. They were followed by Astrid Lorange and Joan Retallack on the 9th, and Julia Bloch and Andrew Rippeon on the 16th. October 23rd saw the dynamic pairing of Eddie Hopely and David Antin, while the month closed out in grand fashion on the 31st with a sets from Dorothea Lasky and Arkadii Dragomoshchenko. You can listen to all of the aforementioned readings on PennSound's Segue Series at the Bowery Poetry Club homepage, which is also home to dozens of recordings spanning the last decade. Stay tuned throughout this week as we bring the series current with readings from November and December. This week, we're catching up with highlights from the Segue Series' fall season at the Bowery Poetry Club. After Monday's run-down of October's events, today we're looking at November's readings. After five October events, the calendar and Thanksgiving conspired to limit November to only three readings, but all three feature spectacular lineups. First up, on the 6th, was the pairing of Lawrence Giffin and Rod Smith, who were followed by Joe Milutis and Alejandro Crawford on November 13th. The month (along with the curatorship of Kaegan Sparks and Kareem Estefan, who organized all of the readings mentioned so far this week) came to a close on November 20th with the all-star duo of Ben Lerner and Marjorie Welish. You can listen to all of the aforementioned readings on PennSound's Segue Series at the Bowery Poetry Club homepage, which is also home to dozens of recordings spanning the last decade. We'll bring our Segue Series listings current with December's readings (so far) later this week, so stay tuned. This week, we're catching up with highlights from the Segue Series' fall season at the Bowery Poetry Club, bringing the listings current with this past month's readings. December marks a changing of the guard, with Thom Donovan and Sara Wintz returning as coordinators for this month and January, and while, once again (due to the Christmas and New Year holidays) the schedule's been limited to three readings, the lineups are spectacular. Starting off, on December 4th, we have the pairing of Thalia Field and Allen Fisher, who were followed on December 11th by Bonnie Jones and Anne Waldman. Finally, Erika Staiti and Andrea Brady brought the month's readings to a close on this past Saturday, December 18th. You can listen to all of the aforementioned readings on PennSound's Segue Series at the Bowery Poetry Club homepage, which is also home to dozens of recordings spanning the last decade, and don't forget to check out our pages for the series' earlier homes, the Ear Inn and Double Happiness. If you don't want to think about snow, then there are thousands of other poems you can listen to over your smartphone, tablet computer or laptop while you wait in transit. Click here to browse through our directory of hundreds of authors archived on our site, and find one of your favorite poets to pass the time with. While collecting snow poems (and desperately trying to navigate our nation's snow-crippled airline system) earlier this week, I inadvertantly overlooked the centenary of one of PennSound's favorite poets, Charles Olson. 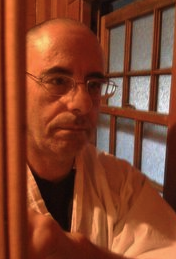 Olson was the subject of the very first PennSound Daily entry in October 2007 and his PennSound author page was not only one of the earliest created for our site, but also one that's experienced the greatest growth, developing into a multifaceted archive that reveals the true breadth of Olson's genius. As a highly-influential figure in postwar American poetics, tapes of Olson's readings and lectures were swapped among poets like Grateful Dead bootlegs, therefore our holdings contain recordings that came to us thanks to the generosity of Robert Creeley, Ron Silliman, Kyle Schlesinger and Fred Wah. Our earliest audio document is a 1954 studio recording from Black Mountain College, and we also have readings from the Poetry Center at San Francisco State University (from 1957), an unnamed location in Boston (1962), Goddard College (also 1962), along with a marathon set from the 1963 Vancouver Poetry Festival and an assortment of unidentified recordings from a variety of locations. You'll also find a number of lectures: a 1962 Goddard College talk on Mellville, a lengthy recording of candid conversation from Gratwick's Highlands in 1963, two recordings from the 1965 Berkeley Poetry Conference (including the lecture, "Causal Mythology"), and five hours of lectures from Beloit College in 1968. Olson's "Maximus to Gloucester, Letter 27 (withheld)" was also the subject of PoemTalk Podcast #34, featuring Al Filreis, Charles Bernstein, Rachel Blau DuPlessis and Bob Perelman. You can listen to any and all of the aforementioned recordings by clicking on the title above. 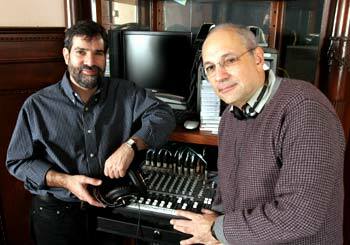 We're always happy to welcome the new year at PennSound — for many reasons, of course, but especially because it's the anniversary of our site's official launch, and on January 1, 2011, PennSound turns six. We've continued to grow by leaps and bounds in 2010, with one of the most noticeable changes being the increased integration of video content — not just from the Kelly Writers House, but from a variety of sources as we further develop our PennSound Cinema holdings — as evidenced by the launch of a PennSound YouTube page in August. 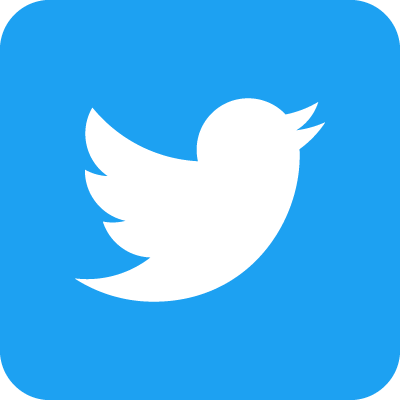 YouTube is only our latest extension into the world of social media, with PennSound maintaining a strong presence on both Facebook and Twitter. This year saw the creation of new author pages for Matvei Yankelevich, Dana Ward, Noah Eli Gordon, Sarah Dowling, Maggie Nelson, Susan Schultz, John Giorno, Mel Nichols, Aaron Kunin, L.S. Asekoff, Victor Coleman, Kristi Maxwell, Michael Rerick, Piotr Sommer, Ray DiPalma, Anna Hallberg, Jörgen Gassilewski, Gary Barwin William Blake F. Scott Fitzgerald and (chronologically last, but by no means least) Michelle Taransky. We continued to add new recordings from listener-favorite programs and series like PoemTalk, Close Listening, the Segue Series, Cross Cultural Poetics, Heatstrings, LA Lit, A Voice Box, Writers Without Borders, EDIT, Whenever We Feel Like It, POG Sound, The Key West Literary Seminars, the Mills College Contemporary Writers Series and the Threads Talk Series, welcomed Susan Howe as one of this year's Kelly Writers House Fellows (and prepared for her visit by releasing several of her wonderful collaborations with David Grubbs), joyfully celebrated Rae Armantrout's taking home the National Book Critics Circle Award and Pulitzer Prize, and mourned the loss of Leslie Scalapino, Michael Gizzi, Peter Seaton, Andrei Voznesensky and Peter Orlovsky. At this time every year, we invite our listeners to revisit some of our founding documents, including the PennSound Manifesto and our launch press release, as well as PennSound Daily entries commemmorating our third, fourth and fifth anniversaries. You can also browse through some of PennSound's previous incarnations via the Internet Archive's Wayback Machine. Finally, we'd like to thank you, our listeners, for your faithful and enthusiastic support over this past year and wish you a happy and healthy new year. We're looking forward to some truly wonderful things in 2011 — chief among them the launch of Jacket2, which will not only bring new materials to PennSound, but also change the ways that we use and comment upon recordings from our archives — and hope that you'll join us once more in the coming year.